Some day you go worldwide if not already. 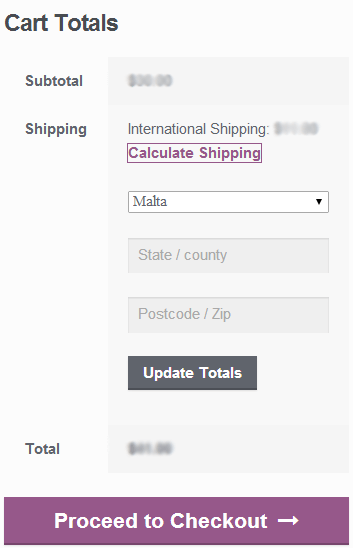 That is the point when you most likely need different shipping rates depending on the order destination. Further assumes your home location is New Zealand. Let's create a similar setup for international shipping. Meet the Duplicate function which can be useful in many cases. Place international rule after domestic ones. Set Titles of the first two rules to Domestic Shipping, and International Shipping for the newly created ones. Also change rule Labels to make navigation easier. Increase free shipping threshold in the first international rule from $130 to $400. Adjust weight rate in the second international rule to something you feel is appropriate. Save settings. Now go the cart page and try how it works for New Zealand and some other country. You will be probably confused. It doesn't work as you expected. It always shows up as Domestic Shipping. Yeah, that's because we forgot to add a destination condition to domestic shipping rules. Return to the settings and add new condition to the very first rule. Choose Destination, is, New Zealand. Repeat for the second rule. Save settings and try it now. 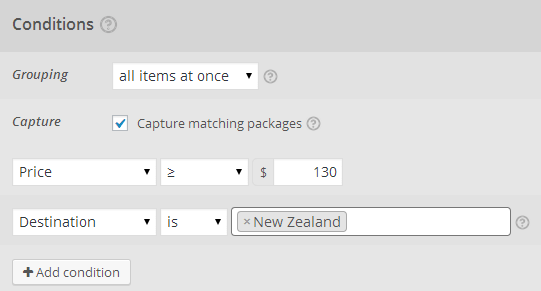 It should show Domestic Shipping when destination is New Zealand, and International Shipping in other cases. In the next step we will touch the magic of the rule tree to refine a bit current configuration.